U.S. 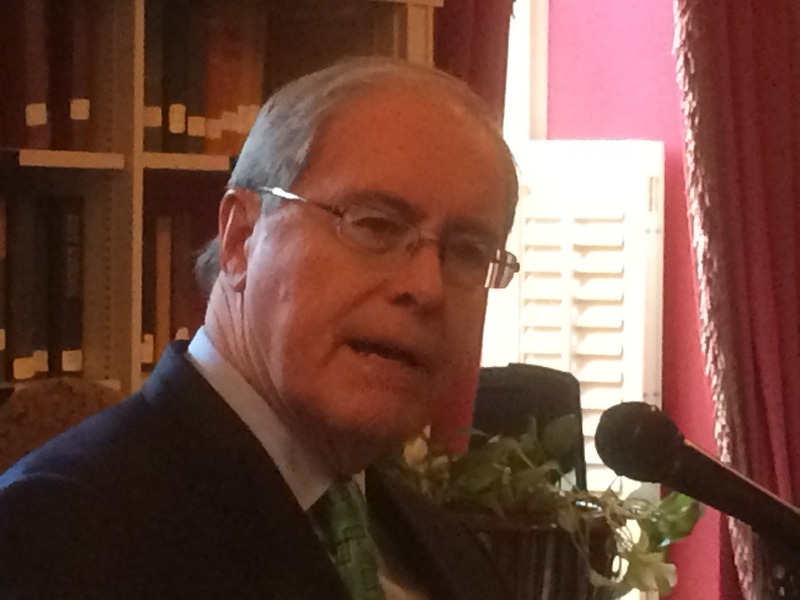 Ambassador to Ireland Kevin F. O’Malley says he is fond of the 2013 book “A History of Ireland in 100 Objects.” He received a copy upon being named to the post in the fall of 2014. To O’Malley, a descendant of County Mayo emigrants, the most poignant object in the book is the “Emigrant’s Teapot,” a symbol of Ireland’s massive one-way migration from the mid-19th century to the mid-20th century, and an enduring reminder of home. But this is the age of the smart phone, a smaller, more powerful object than the tin teapots once carried across the Atlantic. The owners of these modern objects can video chat with each other from either side of the ocean. Likewise, the U.S.-Ireland relationship also has evolved from its historical roots, O’Malley told the St. Patrick’s Day gathering of Irish Network-DC. One big example: more Americans now work for about 250 Irish companies in the U.S. than Irish employed by 700 American companies in Ireland, O’Malley said. Another example: nearly one in six people living in Ireland today has non-Irish parents, just as many U.S. residents are the children of immigrants. Demographics are changing rapidly in both countries. To create new economic links between the U.S. and Ireland, O’Malley launched the Creative Minds Series. The monthly programs invite prominent U.S. artists, writers, filmmakers, digital culture innovators, and musicians to share their experience with young Irish audiences. Then–and who could avoid doing this on 17 March–he sipped some well steeped Irish-American sentimentality. From ‘Ireland in 100 Objects,’ this teapot is in the National Museum of Ireland – Country Life, Turlough Park House, Castlebar, Co. Mayo. This entry was posted in Arts & Culture, Business & Environment, History, Irish America and tagged Kevin F. O'Malley, St. Patrick's Day on March 18, 2016 by admin.